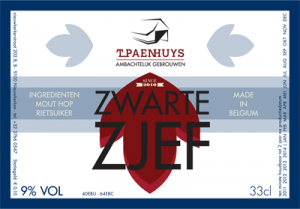 The Zwarte Zjef is a Stout of 9 %. It is translated as Black Zjef.Its color is darkly bordeau, has a slightly roasted coffee flavor and is sweet. We tried to make the Stout more accessible to the general public. Zwarte Zjef has its origin in the birth of Zjef. 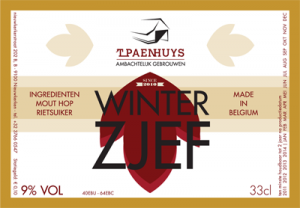 ‘t Paenhuys brewed 3 different beers.The Witte (white) Zjef, the Bruine (brown) Zjef en the Zwarte (black) Zjef. The happy parents elected Zwarte Zjef and our stout was born. 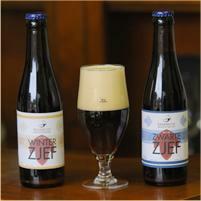 There are also season related variants (Winter Zjef, Zomer Zjef).